iCabbi UK are a friendly, dedicated team, based in Mansfield, Nottinghamshire and we are continually striving to provide the highest quality products and best customer service. In fact, our reputation has been built on the outstanding customer support provided by our UK based support team. 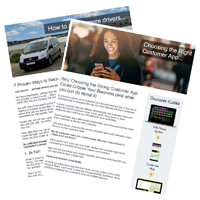 The combination of the market leading iCabbi taxi dispatch solution and our highly regarded customer support is a winning combination, already benefiting 100’s of taxi businesses across the country. Our customers have fleets ranging from just a handful of vehicles to those operating with hundreds in locations all over the UK. Whatever the size of your business, we will aim to help you. Whether you’re looking to make the move from pen and paper to an automated system, or thinking of switching from your current provider, we can create a bespoke deal to suite your business’ needs.